Add a little sparkle to your jewelry collection with this simply classic nose piece. 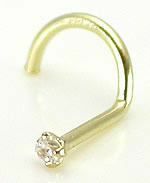 This item is made from 14kt yellow gold and comes with a 2mm prong-set crystal jewel in a martini glass-shaped setting, allowing it to lay flat on your nostril for a subtle diaphanous wink. This 20g nose screw has a 7mm length and a left bend. The yellow gold combined with the crystal's quiet shimmer works with any outfit — casual or formal — and is a reliable accessory for everyday wear.